After listening to bands such as Lady Antebellum and Sugarland, Gloriana is a logical progression. Gloriana is a four-piece band comprising brothers Tom and Mike Gossin, Rachel Reinert and Cheyenne Kimball. Cheyenne used to be a solo artist signed to Epic Records before joining the band. 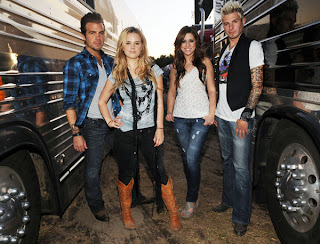 Gloriana's debut single "Wild At Heart" is one of their best. You only need to see their video to realise this. The song has a upbeat, catchy tempo that you just can't help but tap your toe along to and Cheyenne's beautiful guitar playing just serves to add to this song. As a whole Gloriana's songs are mostly upbeat but they all have some sort of message, however loosely it might be portrayed. For instance, the lead song off their debut album, "How Far Do You Wanna Go" talks about someone wanting to leave "everything they've ever known" and start again, and then "If You're Leavin'" has a powerful accapella start and shows the pain of a old relationship were the ex is still around. I haven't been able to see Gloriana live in concert but there are enough live videos on YouTube for a listener to be able to get an idea of the sort of energy that surrounds the group onstage. They have yet to headline their own tour but after having opened for Taylor Swift's latest tour they have definitely succeeded in getting their name out there. As a group it is very easy to compare them to other such bands from the "new country" scene like Lady Antebellum and Sugarland and they are the same in some respects and different in others. There are definitely comparisons that you could draw between songs. For instance, the beat behind "Wild At Heart" could draw a comparison to Sugarland's hit "Everyday America". They do definitely deserve to be recognised as a different band. Their harmonies are reminisent of a young Little Big Town and they have such an energy amongst them with upbeat songs and catchy melodies. I really can't wait for when Gloriana finally get over to the UK and I will definitely be there to see them! Five stars from me!